Honduras: “normalization” …of political violence? Some 500 people marched in Guadalajara, capital of the western Mexican state of Jalisco, on May 20 to demand that the federal and state governments honor their commitments to protect land that is sacred to the Wixárika (Huichol) indigenous group. The protesters’ main focus was the 22 concessions that the federal Economy Secretariat has given to First Majestic Silver Corp (FMS), a Canadian mining company, to extract gold and silver in some 6,000 hectares around Real de Catorce in the north central state of San Luis Potosí. They say this was done without the consent of affected indigenous groups. The Mexican government is violating its own laws on genetically modified organisms (GMO) in the way it handles experimental corn crops, according to a complaint the Greenpeace organization has filed with federal environmental protection authorities. The group charges that the government has failed to monitor experimental transgenic corn adequately, has allowed the corn to be planted on private farms, and hasn’t ensured that the plants are disposed of properly after cultivation. HAVANA, Cuba, May 21 (acn) Until last April 30, 309,728 Cubans were self-employed, out of which 221,839 had received their licenses from October, 2010. According to some data from the Cuban Ministry of Labor and Social Security (MTSS) published in the Granma newspaper, 22 % of the 221,839 self-employment licenses granted (49,349) were held by small food business owners. In addition, the number of licenses for hired personnel (38,704) continues increasing due to new regulations approved for expanding and adjusting the hiring of people in all self-employment activities. Licenses for the transportation of passengers and cargo (13,982) and for producers and sellers of housewares (10,187) have also had great demand. Out of the total of licenses recently given, 68 % of the new holders were unemployed, whereas retired people and state workers account for 16% each. Nearly 200,000 people ascribed to the Social Security Special Regime, including license holders from before October, 2010. Havana is the leading province with the highest number of self-employment licenses granted (66,905), followed by Matanzas (17,943), Villa Clara (15,313), Camagüey (15,926) and Santiago de Cuba (14,354). Armed with machetes and knives, Haitian national police and local officials destroyed some 200 tents in a homeless camp on a public space in the Delmas 3 neighborhood northeast of downtown Port-au-Prince the morning of May 23. Camp residents, who were living there because they lost their homes in a devastating earthquake in January 2010, ran for cover or protested the action while their temporary shelters were demolished. Wilson Jeudy, the mayor of Delmas, a subsection of the capital, claimed that the operation’s target was not the earthquake victims but criminal gangs he said had been using the camp. As of May 12 a group of Haitians left homeless by a massive January 2010 earthquake were facing possible expulsion from their displaced persons’ camp at the Palais de l’Art, in Delmas 33 in the northeast of Port-au-Prince. A lawyer for the property’s owner said he was asking the Interior Ministry to remove the camp residents within eight days. The residents reported that the owner had already started harassing them: on May 9 they found the doors to the toilets locked, and on May 10 the front gate was locked, trapping them in the camp. More than 150 families have been living at the site, according to the Jesuit Refugee Service (JRS). 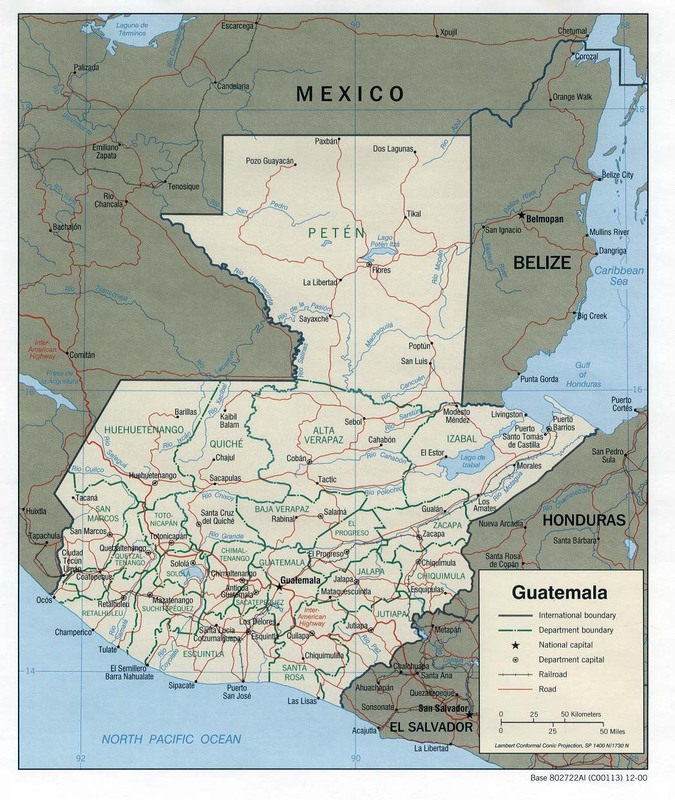 A combined unit of the Guatemalan army and national police arrested a presumed leader of the Zetas narco-paramilitary network May 18, who authorities believe to be commander of the assassination squad that carried out this week’s grisly massacre of 27 farmworkers at a ranch in the northern jungle department of Petén. The detained man is named as Hugo Álvaro Gómez Vásquez, who also goes by “Comandante Bruja” or simply “La Bruja” (The Witch, despite his gender). He was apprehended in Tactic, Alta Verapaz department, following a raid earlier that day on a Petén ranch known as La Mula, just 15 kilometers from Los Cocos ranch where the massacre took place. Authorities say a Zetas encampment was discovered at La Mula, in La Libertad municipality, along with clues on the whereabouts of Gómez Vásquez (see map). Thousands of Hondurans gathered at Tegucigalpa’s Toncontín International Airport on May 28 to greet former president José Manuel (“Mel”) Zelaya Rosales (2006-2009) as he returned from a 16-month exile. After arriving in a Venezuelan plane proceeding from Managua, Zelaya told the crowd at the airport that he would continue to fight for a Constituent Assembly to rewrite the 1982 Constitution; a similar call for a Constituent Assembly was the pretext for a military coup that removed Zelaya from office on June 28, 2009. “We are going to power with the popular resistance,” he said. Honduran campesino Henry Roney Díaz was killed on May 7 when soldiers, police and private guards tried to remove campesinos occupying an estate in the Aguán River Valley in the northern department of Colón. Díaz was a member of the El Despertar cooperative, one of the groups forming the Authentic Claimant Movement of Aguán Campesinos (MARCA). Manuel Vásquez, another member of the cooperative, was wounded in the same clash. Two Chilean Mapuche prisoners, Ramón Llanquileo Pilquimán and José Huenuche Reimán, were admitted to a hospital in Victoria, Malleco province, Araucanía region, on May 26 after 72 days of a liquids-only hunger strike. Corrections authorities denied that the prisoners’ lives were in danger; Araucanía health secretary Gloria Rodríguez said “the Mapuches are being monitored permanently,” without offering an opinion on their condition. Thousands of Aymara indigenous protesters took over the city center of Puno in southeastern Peru May 26, and the city remains shut down. The main roads into the city are blocked by barricades erected by local campesinos demanding that the government revoke concessions recently granted to the Canadian Bear Creek mining company. Looters taking advantage of the unrest ransacked shops and offices as the police retreated, and numerous cars and government buildings were torched. Aymara from the Bolivian side of the border have joined in the roadblocks. With police confined to barracks, the city and environs are effectively in the hands of the protesters. Mining projects in Colombia face an uncertain future following a May 11 ruling of the country’s Constitutional Court that struck down a mineral code passed last year—although the regulations will remain in effect for two years to give Congress time to draft and approve a replacement bill. In its 7-1 ruling, the court found that the mineral code was unconstitutional because indigenous and Afro-Colombian communities on potentially impacted lands weren’t consulted. Under the international convention known as ILO 69, approved by Colombia in 1991, indigenous inhabitants have the right to prior consultation on any decisions affecting their territories. However, the ruling is controversial because the code—known as Law 1382—included new environmental restrictions, including a ban on mining in the fragile highland ecosystems known as páramos (alpine grasslands). The Colombian Senate on May 25 passed the Victims and Land Restitution Law, to provide financial compensation and the return of usurped lands to victims of internal “armed conflicts.” President Juan Manuel Santos called the approval of the law “historic.” But his predecessor Alvaro Uribe bitterly fought the law’s wording, arguing that it equated the state’s actions with those of the illegal armed groups. In compromise wording, the law describes illegal armed groups as “terrorists.” Claimants who have been victimized by armed conflicts since January 1985 are eligible for financial compensation. Those who have had their land seized, or were forced to abandoned their lands, are entitled to restitution of their property. The government estimates that 4 million hectares of land were abandoned and 2 million were seized during the conflicts. Senator Juan Fernando Cristo (Liberal Party) stated that the law ushers in “part two of the history of this country.” The restitution process is expected to take 10 years to complete. The Brazil House of Deputies passed reforms to the the country’s forest code May 24 that ease restrictions on deforestation and provide amnesty for prior deforestation violations. The amended code would allow small farmers to cut down trees on hilltops and along rivers, two areas that were previously protected. It would also provide farmers with amnesty for violations of the forest code prior to July 22, 2008. The amendments were mainly pushed by Alldo Rebelo, head of the Communist Party of Brazil, who argues that the restrictions are disproportionately hurting small-scale farmers. The amendments still have to be passed by the Senate, where they are expected to meet tough opposition, and be signed by President Dilma Rousseff before taking effect. A group of 10 former environmental ministers sent a letter dated May 23 to the president urging a balanced approach to environmental regulation that will promote both the agricultural industry and environmental sustainability. This entry was posted in Background & Analysis, Canada, Central America, Chile, Colombia, Corporations, Counterinsurgency, Cuba, Events, Haiti, Human Rights, Imperialism, Imperialist Interference & Views, Mexico, Obama, US Foreign Policy, Venezuela. Bookmark the permalink.